Designed by Juneau artist Pat Race, the stickers were originally distributed to a limited number of early voting locations. Due to their popularity, the state has expanded the initiative to 11 communities, including Unalaska. Special voting stickers have arrived in Unalaska — just in time for Tuesday's general election. 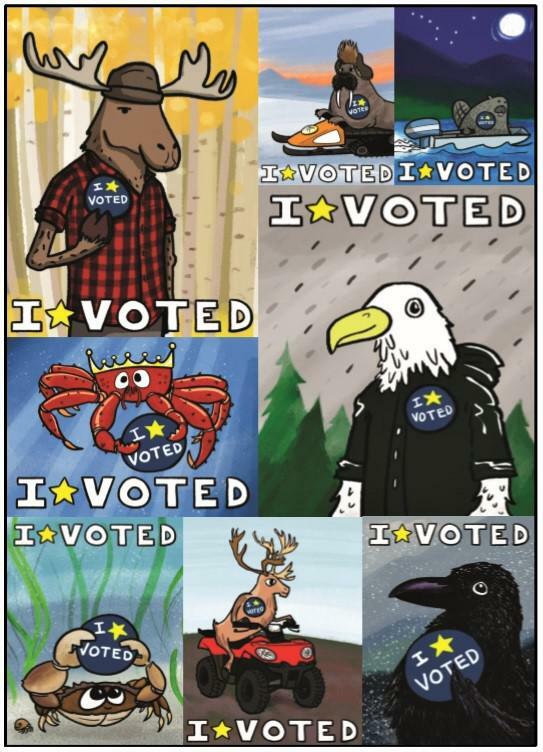 The new "I Voted" stickers feature cartoon versions of iconic Alaska animals — from bald eagles and beavers to caribou and red king crab. Designed by Juneau artist Pat Race, the stickers were originally distributed to a limited number of voting locations as a way to encourage Alaskans to cast their ballots early. But due to the stickers' popularity, the state Division of Elections (DOE) expanded the initiative to 11 communities, including Unalaska. As the stickers only arrived Thursday, officials say the 60 island residents who already voted are welcome to stop by City Hall and pick up their prizes retroactively. Unalaska has stickers in English, Spanish, and Tagalog. The city did not receive any in Unangam Tunuu, the Native language of the Aleutian and Pribilof Islands. While the state printed Unangam Tunuu stickers, DOE spokesperson Samantha Miller said it only has a "small supply," so they were not included in the batch sent to Unalaska. Miller did not respond to a question about where those stickers were distributed instead. The new stickers will be given to Unalaska voters on a first-come, first-served basis until they run out. After that, city officials say they'll still have plenty of the traditional blue and gold "Big Dipper" stickers. Tuesday is Election Day. The polls will be open at City Hall from 7 a.m. until 8 p.m. In a post-election shake-up, Unalaska's school board has a new member and a new president. Carlos Tayag was sworn in Thursday after winning seat A with 86 percent of the vote in this month's local election. "Thank you, I'm excited," said Tayag, taking an oath administered by Superintendent John Conwell. Conwell praised Tayag's work as a youth programming coordinator for the city's Department of Parks, Culture, and Recreation — and recalled his first meeting with Tayag years ago. The Unalaska City Council has certified the results of last week's municipal election, which brought 433 voters to the polls. "We had a 21.5 percent voter turnout, which was lower than last year by about 10 percent," said City Clerk Marjie Veeder. Unalaskans largely followed statewide voting trends in Tuesday's primary, although local turnout was low. Island Republicans picked former state senator Mike Dunleavy as their gubernatorial candidate with 40 percent of the vote — and longtime incumbent Don Young as their Congressional candidate with 63 percent.